“Personal Data” as “certain individual data which is stored, maintained and kept accurate and the confidentiality of which is protected”..
“Personal Data” as “certain individual data which is stored, maintained and kept accurate and the confidentiality of which is protected”. “Certain individual data” is defined as “true and actual information that is attached to and identifiable towards, directly or indirectly, an individual”. •To provide effective service delivery to our guests, ensuring that all needs and requests made by each guest is accurately and efficiently attended to. •To process or purchase credit transactions. •To process and respond to guest enquiries. •For security purposes and verification of identity and reservation confirmation. •For marketing research purposes to better understand our guests and their preferences, and to improve guest experiences, and to conduct statistical or demographic analyses. •To comply with a court order or other legal process or other legal requirements of any governmental authorities. •In the sole discretion of Le Grandeur Balikpapan, in exceptional circumstances such as a national emergency, security concern or other situation in which Le Grandeur Balikpapan deems disclosure is prudent. When you visit our website, you may be initially given a “cookie”, and your computer is assigned an ID number. This is a common practice on most commercial websites. A cookie is a commonly used device that tracks an individual user’s preferences, and is capable of enhancing your visit to the site. Cookies allow us to provide a customized experience without the visitor having to remind us of his or her preferences each time they visit our site. By accessing our website, you agree that we can place cookies in your device. Le Grandeur Balikpapan automatically logs all traffic to and from our website. These logs include domain information that is used to maintain aggregate website data and aids us to learn about the online behaviour of our guests, including how often they visit the Le Grandeur Balikpapan website and their click-through behaviour on our website. This information is used to improve our website’s content and navigation for our guests and to personalize our guests’ online experience. Our cookies do not contain any personally identifying information and do not follow visitors when traveling on the Internet after leaving the Le Grandeur Balikpapan website. Most Internet browsers automatically accept cookies, however, you can block them by adjusting the settings on your Internet browsers. Kindly note that by rejecting or blocking cookies, you may be restricted from using some services and features on our website. When submitting a request for information, such you will be asked to complete a form that includes your contact information. All information captured is secure. You may also wish to submit your e-mail address in order to be placed on a subscription mailing list to receive other information about Le Grandeur Balikpapan, including but not limited to, events and promotions. In deciding whether or not to join such lists, please note that Le Grandeur Balikpapan does not sell or rent our lists to anyone. In the event that you choose to join our subscription list, you may ask to be removed from the list at any time. You will always have the ability to accept or decline any form of communication from Le Grandeur Balikpapan. Reservations can be made via our website reservations system, over the phone by calling our Reservations Agents or through Travel Agents, Online Travel Portals and email. In order to process a reservation, you will be required to share information such as your name, address, contact details, credit card details and preferred method of payment. During the course of your reservation process, you may also choose to share any preferences or requests to enhance your experience at Le Grandeur Balikpapan. All personal information obtained during the reservations process will be communicated directly to Le Grandeur Balikpapan. For bookings made directly through the Le Grandeur Balikpapan website or through our Reservations Agents, you will receive a confirmation email of your reservation. All information captured during a reservation process directly to Le Grandeur Balikpapan is secure. Information such as credit card numbers is protected. Purchasing transactions are facilitated by third party processers who are required by contract with us to protect the privacy of your personal data. We may obtain personal and non-personal data about you from other sources, for example when you make your reservation through a Travel Agent or Online Travel Portals. In situations in which a third party under contract with Le Grandeur Balikpapan collects personal data about you, we will require the third party to exercise reasonable care in protecting your information so that it is in compliance with applicable governing law and the PDPA. Please refer to the privacy policies of those third parties to better understand their activities and practices. During your stay, we record your itemized spending and transactions to properly assemble your guest profile. This information is recorded to comply with our financial reporting requirements, including those imposed by our auditors and government regulators. We may also collect certain information as required by local laws (e.g. passport number). Information particular to your stay may also be stored (i.e. health issues, payment difficulties, special requests, service issues). This specific information is stored in our property management system and is combined with information from previous visits that you have made to Le Grandeur Balikpapan. You may advise us if you do not want personal preferences shared. In addition, we may retain the content of any document (including letters, comment cards, electronic documents such as e-mails and other similar forms of communication) that are sent to Le Grandeur Balikpapan before, during or following your stay. This information may be shared within the employees of Le Grandeur Balikpapan and relevant partners. 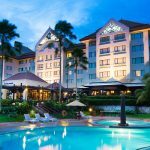 If there is any suspicion of unlawful activity taking place, Le Grandeur Balikpapan may investigate and/or report its findings or suspicions to the police or other relevant law enforcement agency.